View of the remains of the Prospect Theatre. B.F Keith’s Prospect Theatre opened on September 7, 1914 in the Prospect Park neighborhood of Brooklyn, NY. The 2,381 seat theater was constructed on the site of a synagogue and three apartment buildings. It was designed by architect William McElfatrick for the Keith Vaudeville Company. The Prospect was dubbed “the woodless and postless theater” while it was being built due to the fact that no wood was used in its construction and there were no posts helping to support the balcony. Woodwork was left out of the building so that the theater would be much safer if a fire broke out. The balcony was supported by a 65 ton steel beam, which eliminated the need for support beams that could have obstructed views during performances. Opening advertisements boasted that the balcony was strong enough to support the world’s ten heaviest locomotives. 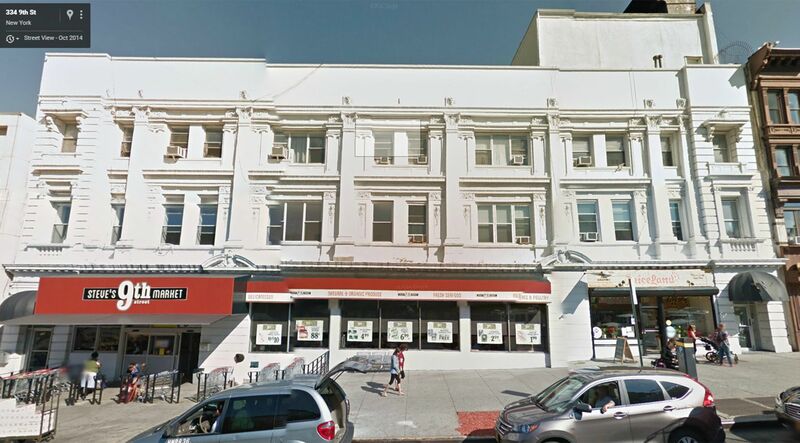 According to an article in the New York Clipper, a weekly entertainment newspaper, the Prospect originally presented shows from the Keith’s Palace Theatre in Manhattan, which was the flagship theater of the Keith’s circuit at the time. Brooklyn Borough President Lewis H. Pounds was unable to attend the opening celebration, but sent along a message that read, “By building one of the finest theaters in the United States in the heart of Brooklyn, the Keith interests have paid a tribute to the wonderful growth of the borough.” The Prospect opened with a stage show called The Bride Shop as well as performances from Sam & Kitty Norton, Nellie V. Nichols, Joe Jackson, Lyons & Yosco, The Great Asahi, Kluting’s Entertainers, Gliding O’Mearas, and Weber & Capitola. Vaudeville acts performed at the theater twice a day until May 15, 1916, when the theater switched to showing silent films in conjunction with the live acts. A Moller organ was installed in 1920, and replaced by a Wurlitzer Opus 1497 in October 1926. 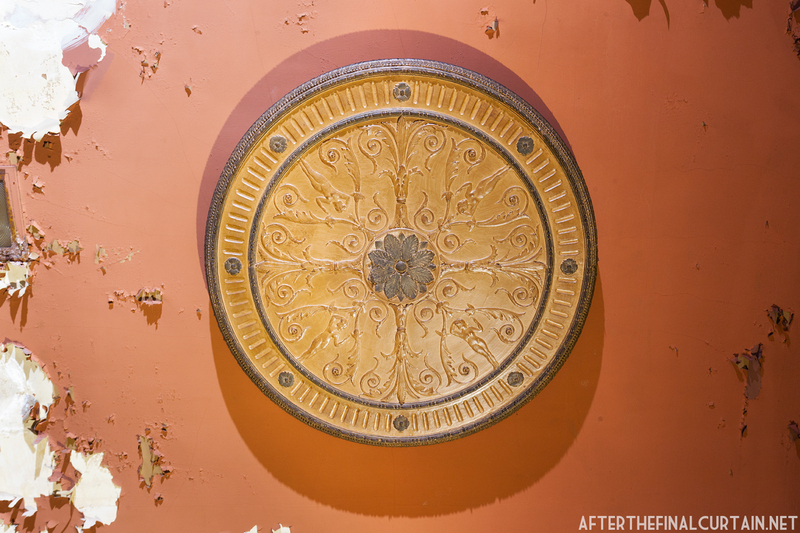 The ceiling of the Prospect Theatre. In 1922 Ted Healy, a comedian from Brooklyn, was scheduled to perform at the theater but the acrobat in his act quit. As luck would have it, Moses Horwitz, an old childhood friend of Healy’s who was also a vaudeville performer, was backstage waiting to say hello to him. Healy asked Horwitz, better known today as Moe Howard, to temporarily join his act and Horwitz agreed. The show was a huge hit and soon after Moe’s brother Samuel (Shemp) joined them as Ted Healy and his Stooges. The temporary partnership ended up lasting over ten years before splitting up. In 1934 Howard, his other brother Jerome (Curly), and Larry Fine signed with Columbia Pictures as the Three Stooges. 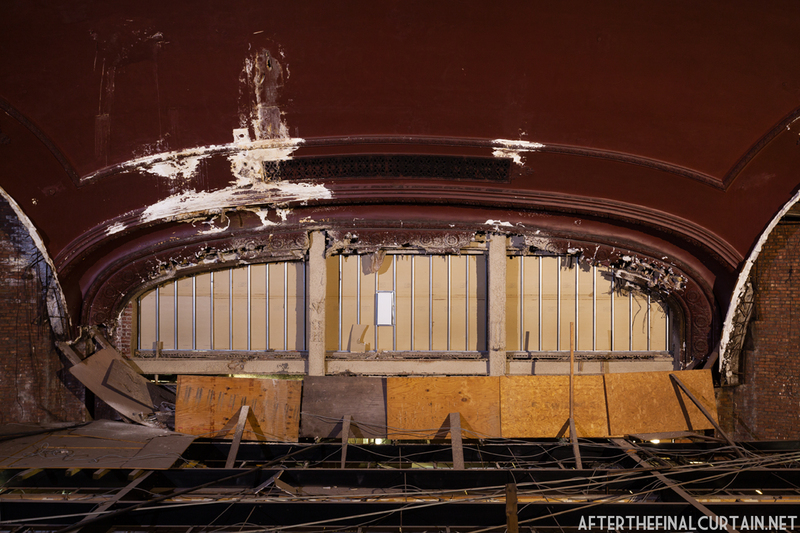 The Proscenium arch was damaged in the 1980’s when the stage house was converted in to condominiums. In October 1928, The Radio Corporation of America (RCA) combined with the Keith-Albee-Orpheum (KAO) vaudeville theater circuit, and the Film Booking Offices of America (FBO) to form Radio-Keith-Orpheum also known as the RKO Corporation. A little over a year after the merger the theater was renamed the R.K.O Prospect Theatre. 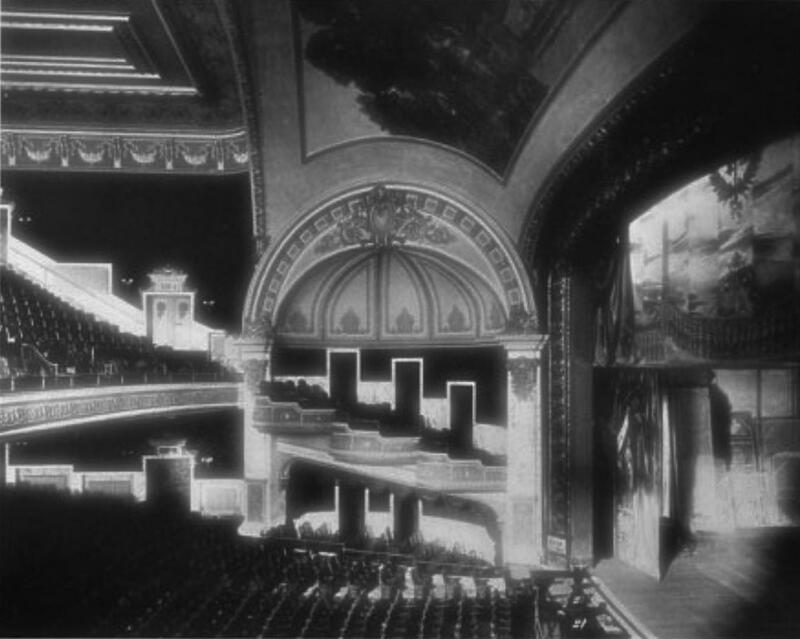 Around the same time vaudeville acts had begun to be phased out in favor of motion pictures, and when they did perform it was as a short opening act for the feature films. However, vaudeville returned to the Prospect five years later on July 16, 1932. This was partially due to patrons writing the theater and promising to support vaudeville shows. Tap dancers Cherry Blossom and June, the Radio Rogues, comedians Bud and Jack Pearson performed during the opening night. The famous illusionist Hardeen, the brother of Houdini, performed at the theater on March 28, 1933, and escaped from a specially constructed packing case. Mayor LaGuardia ordered the theater to close for one day on Thursday, August 9, 1934 as punishment for holding a “Shirley Temple Resemblance Contest.” Joseph Freytag, the theater manager, applied for a permit to hold the contest but was denied. The Prospect played a very small role in the USSR/USA conflict known as the Cold War. On August 3, 1948, Whittaker Chambers, a former Communist Party member, testified before the House Committee on Un-American Activities that he introduced Alger Hiss, who worked for the State Department, to a Soviet spy in the balcony of the Prospect Theatre in early 1937. On Sunday January 28, 1962, the Three Stooges, which at the time consisted of Moe Howard, Larry Fine and Curly-Joe DeRita, returned to the theater while on a promotional tour for their film “The Three Stooges Meet Hercules.” Accompanying them on the bill was Dave Ballard, an almost eight foot tall man known as “The Herculean Giant”, and DJ Clay Cole. 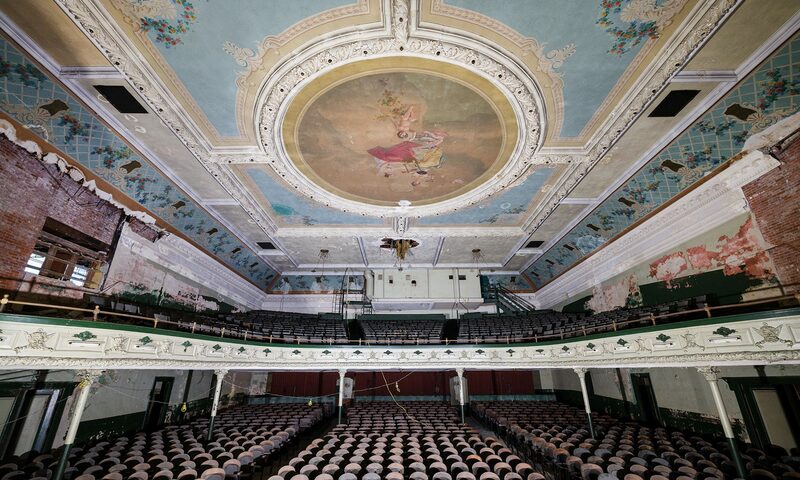 The projector room was added after the theater opened in 1914. The Prospect closed in 1967. 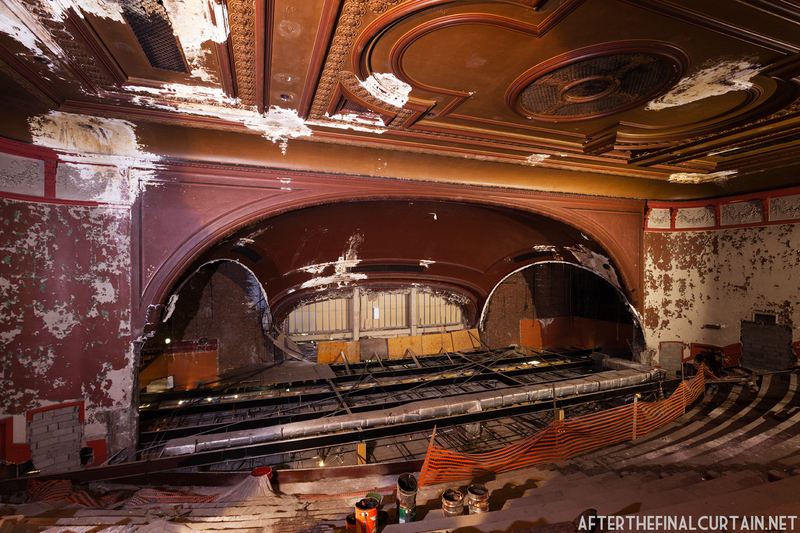 In 1970 the lobby, and orchestra sections were gutted and converted into a supermarket.Gary Rosen and Jacob Bouganim, two Brooklyn developers, bought the 16,000-square-foot stage area as well as the 100 by 700 foot lot beneath it for $500,000 in 1986. They converted it into 15 condominiums. According to Bouganim, they were interested in the building because it’s much high than most of the buildings in the neighborhood, and has unobstructed views of Manhattan. 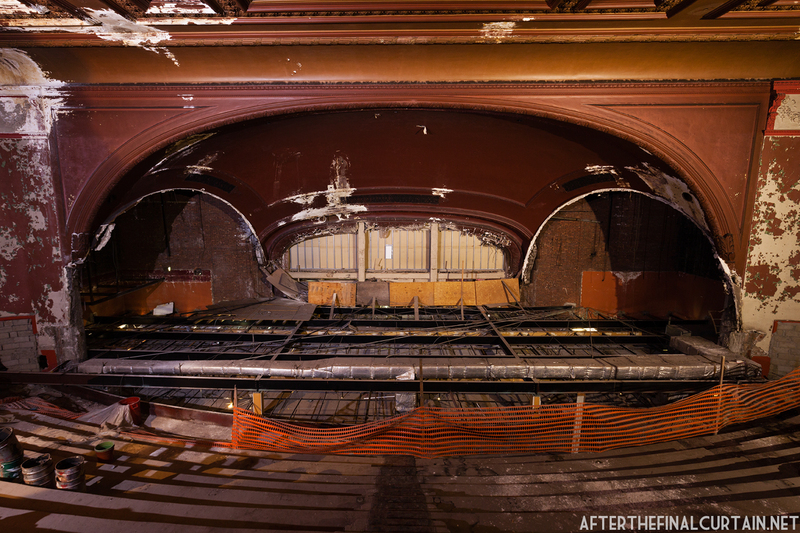 The balcony is all that remains of the original Prospect Theatre. 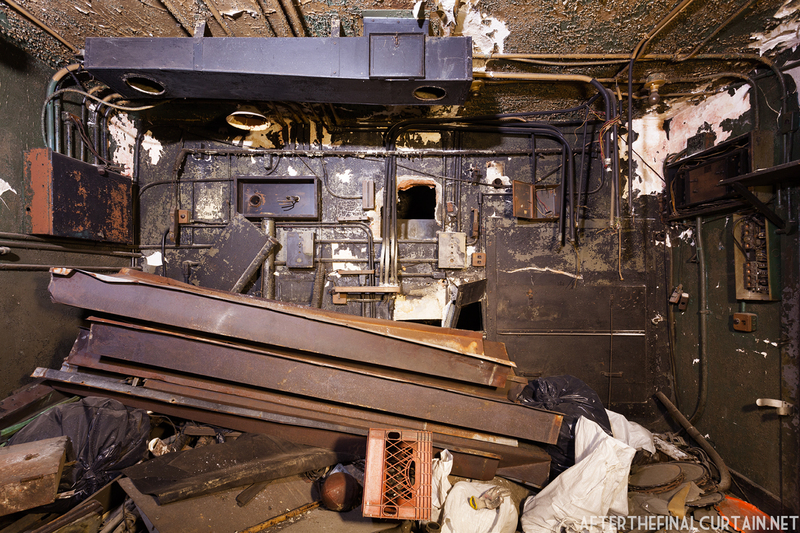 The interior of the projector room is full of construction debris. 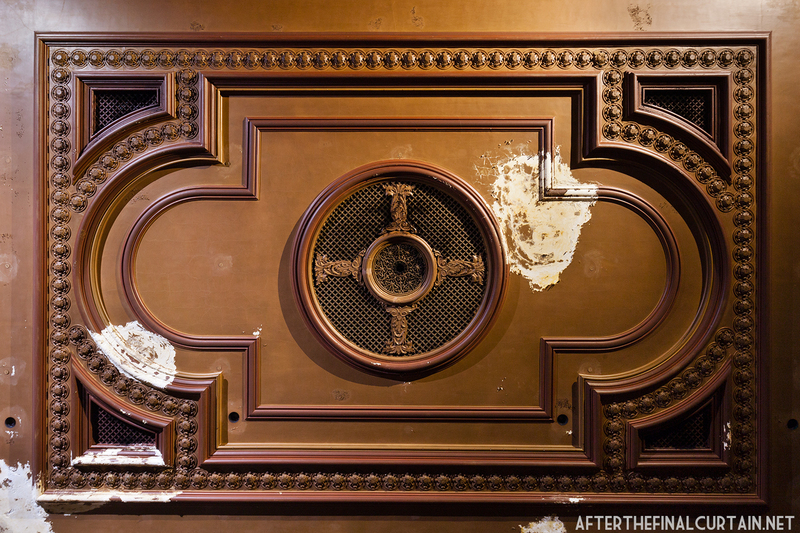 Much of the interior decor was removed in the 1940’s. Fascinating commentary. Welcome back to the blogosphere! Do you have any photos of the exterior, the condos, or the supermarket? I’m trying to understand the context of these remains with the newer developments. Thanks for finding this. 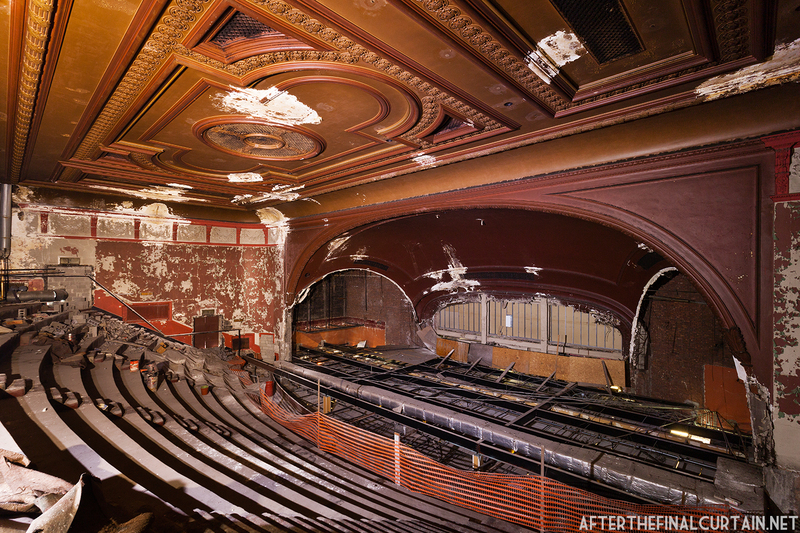 It’s a shame most of the theatre has been lost, but at least it wasn’t entirely demolished. 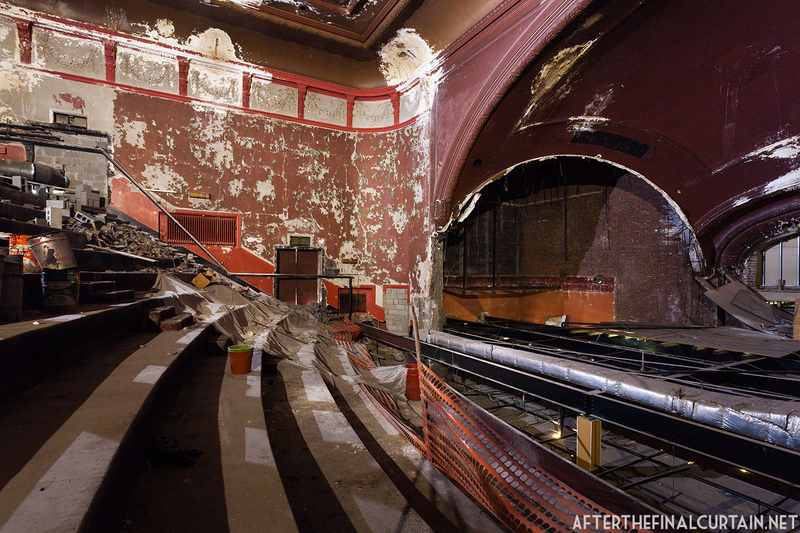 How accessible is the balcony and what remains of the stage proscenium? Would it be possible to use it as the basis for a performance space? The Park Slope neighborhood could certainly support it. It’s barely accessible at all. 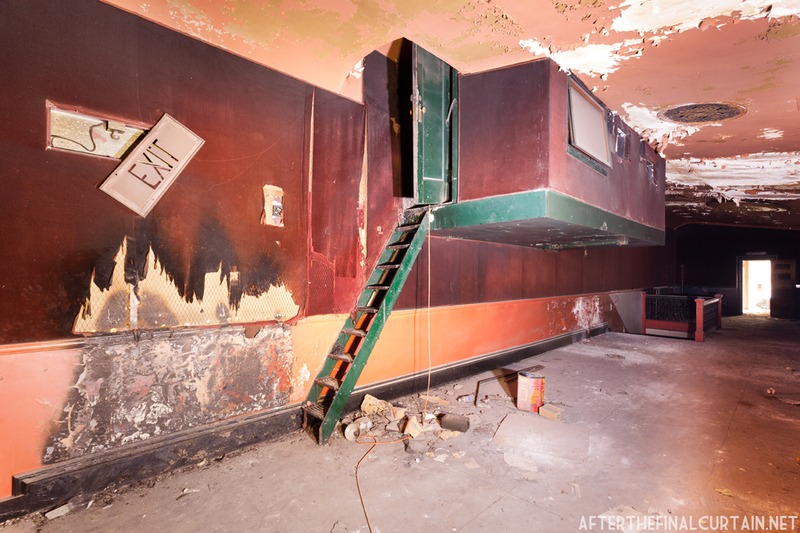 To photograph it I had to climb up a 45 foot metal ladder that lead into one of the theater restrooms. It would take a lot of work to get it ready for even the most rudimentary of performances. Hi Matt! I actually live in one of the 15 condos on the other side of the building. I knew about the history of the building but I had no idea that any part of the original structure within the theater was still there (I thought it was just the supermarket and the apartments now, and it didn’t occur to me there was unaccounted for space above the supermarket). If you want to want to see the other side of the building I would be glad to give you a tour. I also have a question, how did you actually get into the theater? Did you have to go through the supermarket? I’d love to check it out but am not sure if it’s a possibility or where to begin. I’d love to see the theater just because of the Three Stooges significance. It’s the theater where Moe Howard joined Ted Healy on stage to become one of his Stooges. Really look forward to these postings with a nostalgic eye on my distant youth. Are there detailed photos of the great theaters in Manhattan, eg: The grand Roxy, Capitol and of course the Paramount and Palace? 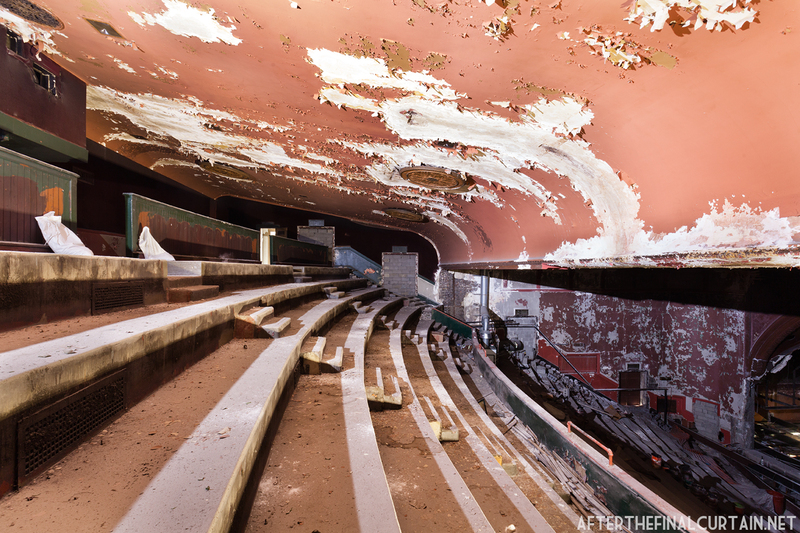 In high school I ushered at the Valentine Theater on Fordham Road in the Bronx. It was not a very grand place, when up the street were the RKO Fordham and the Paradise. Frankie – I did the same thing before I photographed the place. They didn’t believe me until I came out of a back room covered in dust. I’m not particularly claustrophobic, but my God, that shot across the highest balcony (the LaGuardia caption) scares me. I can’t believe that they would expect people to sit in a space like that.